This review only contains spoilers if you haven’t read The Wicked We Have Done. Our Broken Sky tells the story of Val, who’s in the Compass Room together with Evalynn, the protagonist of The Wicked We Have Done. We see Val together with her family, in the Compass room, and a glimpse of her beyond. Val is one of the most interesting characters in The Wicked We Have Done. She has this really tough exterior, which makes you wonder what’s beneath. She has murdered the three guys that raped her twin sister, and has spent years in prison before she’s convicted to the Compass Room. 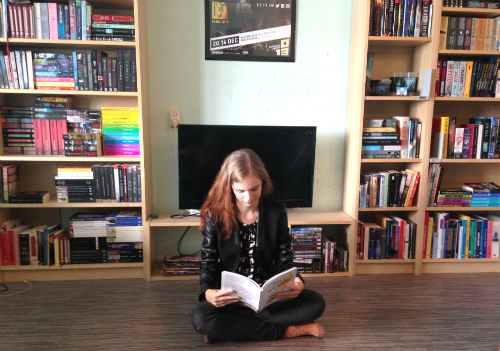 It’s nice to see the story from her point of view, and to spend some time in her head. Our Broken Sky feels more like a collection of short stories rather than a novella. Novellas are incredibly hard to do well, and this one falls short of the format. It’s at this weird, uncomfortable pace, and skips over exactly those scenes I was most looking forward to. For example, the murder of the rapists falls outside of the scope of this book. So does her time in prison. The novella flashes through events at an incredible speed, because if it doesn’t, it would evolve into a full length book. 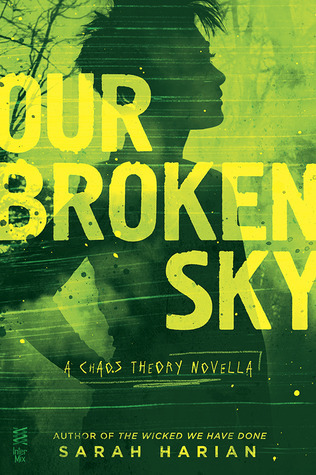 I would recommend Our Broken Sky for fans of the Chaos Theory series that are interested in Val. Or in some lesbian lovin, because this novella has plenty of that too. If you’re new to the series, don’t start here. Almost everything that happens in The Wicked We Have Done is described in this novella in a few pages.